Some Thoughts on Apple: It’s Still Growing. A lot. Apple’s stock is trading lower by about 8% today after the company reported earnings last night. Revenue and earnings per share actually beat analyst estimates, but company commentary, guidance and lower than expected iPhone unit growth seems to be spooking shareholders. In the eyes of many investors, the problem with $AAPL is that it is no longer a “growth company,” meaning that since the company’s revenue and earnings growth has slowed, it should trade at a lower earnings multiple. It is true that all else equal a slower growing company should trade at a lower multiple than faster growing companies, but in Apple’s case, the company is trading at a significantly lower multiple than many slower growing companies. 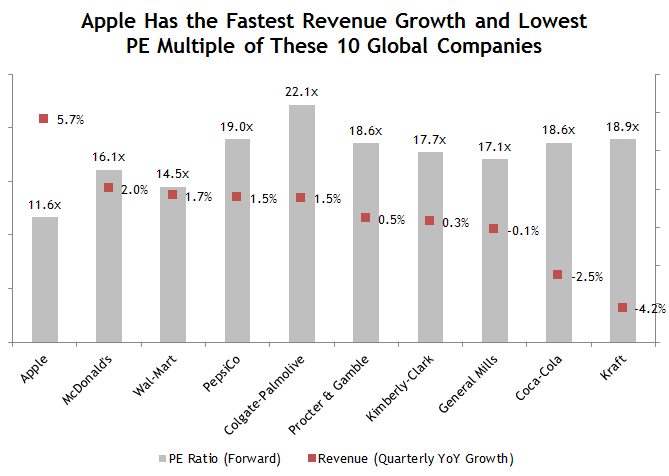 The chart below shows Apple’s revenue growth rate compared to nine other blue chip, mega-cap, global companies. 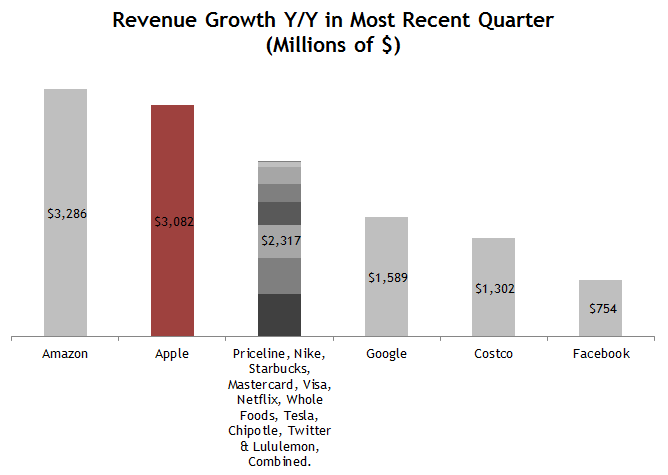 Apple has the highest revenue growth rate of the group by far. On average, the revenue growth of the other nine companies has actually been flat over the last 12 months. Still, Apple has the lowest multiple of the bunch, again by a significant amount. The average multiple of the group is 18.1x forward earnings. If Apple sold at that multiple, its share price would be nearly $800. Bears might argue that the reason Apple trades at a discount is that its business prospects are less stable than many of the companies on this list. However, the other businesses on this list have long term headwinds too. Apple may be losing some market share in the US, but so are soft drinks, processed foods, and junk foods in general, especially among trend-setting consumers. That trend affects McDonalds, Coca-Cola and Pepsi. Branded merchandise is also losing share to private label merchandise (Procter and Gamble, Kimberly Clark, General Mills, Colgate and Kraft all stand to lose from that trend). And Wal-Mart is a “dying” brick and mortar retailer. Most of these companies and their shareholders are focused internationally for growth, which is the same growth avenue that Apple is now focused on. The fact that Apple is growing revenue at a faster rate than any of these other blue chips implies that it is executing better. Yet inexplicably it trades at a lower multiple–and all that is before you even consider the company’s cash holdings. Apple’s superior growth rate is even more impressive when you consider the fact that Apple already generates more revenue than all of these companies except for Walmart (Walmart has lower margins though). That means that the same percentage growth is worth much more growth in dollars. In Apple’s “disappointing” quarter, the company grew revenue by $3.3 B. If you compare that revenue growth to some of the market’s hottest growth stocks, you can see that Apple really still grew by a staggering amount last quarter. The chart below includes some of the hottest growth stocks in today’s market. The only company which grew revenue by more dollars than Apple was Amazon (but again at much lower margins). Google only grew revenue by half as much as Apple, Facebook only by one fourth as much. In fact, Apple grew revenue by $700 m more than Priceline, Nike, Starbucks, Mastercard, Visa, Netflix, Whole Foods, Tesla, Chipotle, Twitter and Lululemon combined. These are much smaller companies than Apple, so their revenue percentage growth rates are much higher, and so is their multiple. But their market values are not much smaller in some instances. Google and Apple now have nearly the same market value (backing out the cash). This implies that the market believes that Google will eventually match or exceed Apple’s financial muscle. Arithmetically it’s impossible to do that when you’re growing revenue at a lower dollar amount. Google will have to maintain its revenue growth rate for a long time to match Apple’s current size. That’s no easy task, even for a company growing at a rapid rate. Empirically, Apple is still a growing company, although you wouldn’t be able to tell from today’s price drop. The company may be growing at a slower rate than it once was, but it’s cash flows are also cheaper than many companies growing even slower and with similar prospects.